We've tried a lot of seamstick, and this is the best for the price. Super sticky. 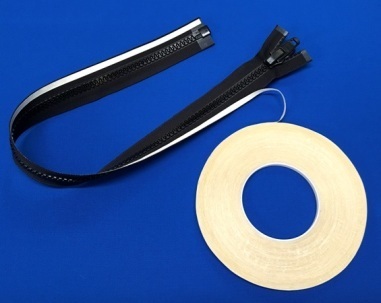 This double-sided tape is an indispensable tool for holding fabric together while being sewn. Adheres well to Sunbrella and most types of sail material. Made by 3-M, formerly Super-Tack Seamstick by Venture Tape. Approximately 60 yards per roll. Available in 1/4", 3/8" and 3/4". 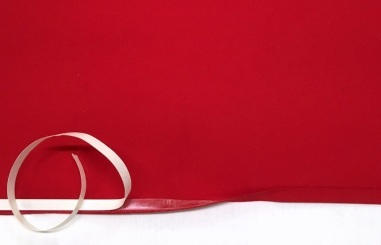 Use 1/4" for zippers and vinyl, 3/4" for overlapped seams on Sunbrella and canvas and 3/8" for everything else! Shipped both items in same box even though they were ordered on the weekend two days apart. What made it even sweeter was they put in a piece of candy. A really handy product, Really cuts down on pinning what your working on. Great Stuff. Very Sticky stuff. Works on Sunbrella as well. I continue to be impressed with the excellent customer service Sailmaker's Supply delivers. They're a pleasure to work with! I have been using this product for about three years and have been very pleased. I work all day with various types of leather and canvas. This product holds true on all of them. Very pleased. Wish a 1/8" width was available. 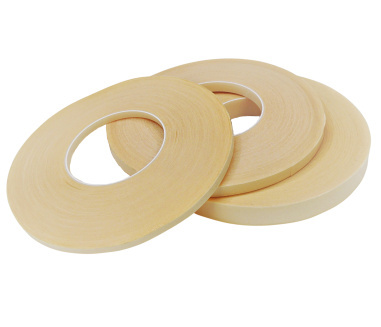 Purchased the double sided tape for gluing the panels of my model sailboat sails. It seems to work well. I have not been using it long enough to assess it's long term durability tho. The produce was shipped promptly, and arrived in good shape. Excellent service. I purchased the SeamStick not for anything sail related. I am a custom handbag maker and use a lot of a similar product. The other product is pricey and only comes in small quantities. I purchased the 60 yd roll of 1/4" and it works perfectly at a significant lower cost. Shipping was super quick too! I'll be back for more for sure! Perfect tape. I used for taping leather pieces together for sewing to make leather notebooks. Very sticky. Just what I needed! Thank you! I started using Seamstick several years ago for a marine canvas project. Now I use it for all kinds of sewing both home decor and clothing. It really holds fabric in place while being sewn. It's great for creating no sew piping and for basting zippers in place. This seamstick will stick and stay on anything. I have used other seamsticks purchased elsewhere and they have disappointed, especially when used on Sunbrella, duck cloth or regular canvas. But this product works on all heavy fabrics. I would be cautious, however, using it on light fabrics as the needle can get gummed up rather quickly. Highly recommended! Saves a lot of time and reduces (eliminates) misalignment while stitching large heavy fabrics. Wonderful stuff! Allows pre-assembly fabric for test fitting and sewing. 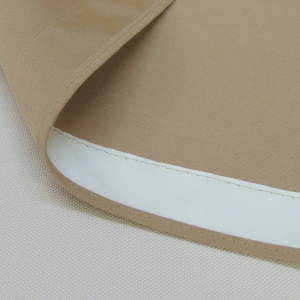 Especially great for contoured seams and holding alignment with heavy slippery fabrics like marine canvas. Everything was great. I received order in a timely manner. Very sticky! Worked very good for seaming together Tyvek for a ground cloth. This is a very good source at excellent prices, terrific customer service and fast shipping. I highly recommend Sailmaker's Supply to all boaters. Good products, awesomely fast service. I love this stuff. I use it for so many projects, not just marine items. You can sew over it, and it doesn't gum up the needle. I have tried to find it at other sites with no luck. Thanks a bunch! Seamstick is a double-sided seaming tape with acrylic based adhesive on a Mylar carrier. We prefer "Venture Tape" brand as it sticks to Sunbrella® better than most. We sell seamstick in 1/4", 3/8", and 3/4" widths. It comes on rolls with about 60 yards per roll. The width we use most in our canvas shop is 3/8". Seamstick is a great tool for holding any kind of fabric in place while sewing. It sticks exceptionally well to vinyl, such as Weblon Regatta, so when we're sticking vinyl to vinyl, we use 1/4". If you stick it in the wrong place, use "Goo Gone" to remove any excess adhesive residue from the vinyl. To sew an overlapped seam, apply a line of 3/4" seamstick to the salvage edge of one of the panels. Stick the second panel to the first using the inside edge of the seamstick as a guide for an even 3/4" seam. Sew along the edge of the top panel, flip the panels over and sew on the edge of the other panel. Seamstick is essential for sewing sails. 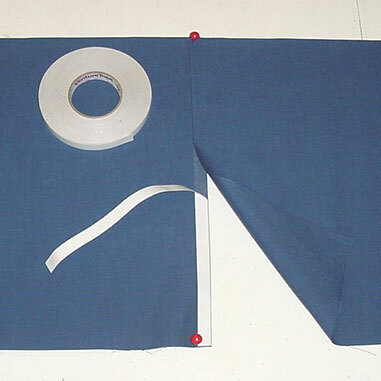 For seams in sailcloth, apply 3/8" seamstick in the seam allowance of the lower panel and stick the next panel to it. Use it to hold patches, luff tape, webbing, etc., in place for sewing. Use seamstick to stick vinyl laminate cloth to the inside of hatch covers, dodgers, etc., as a reinforcement for fasteners and to finish the edge. When applying, be careful not to stretch the seamstick. This can cause the fabric to pucker when the seamstick relaxes. It's easier to apply the tape if you first pin the fabric out on the table. I have noticed in working with Sunbrella®, that seamstick tends to not want to stick to new fabric. It sticks better to Sunbrella® that has been on the shelf for a while. I imagine it has to do with the water repellent treatment. If the tape isn't holding as well as you'd like, press it down with a hard metal object, such as the handle of a pair of shears. You can use an iron, but note that Sunbrella's® warranty is void if heat is applied. Use only a cool iron on Sunbrella®. If you have been struggling to hold your fabric together while you're sewing, give our seamstick a try. I'm sure you'll find it as indispensable as I do!